Use the Formal Record Hold Notice Form to provide details of a legal case and list all relevant documents. This letter provides notice of documents to be reviewed and placed on hold so they will not be destroyed or disposed of. of the most comprehensive kits of its kind that I’ve seen and it includes a lot more than just proposals. You get some great templates to help you write business plans, invoices, quotes and more. It served as a useful starting point when putting together complex documents." This Formal Record Hold Notice Form is included in an editable format that can be customized for your own needs. Records Custodian's Name: Insert name of record keeper. Name of Requestor: Insert name of person requesting record hold. Case ID Number: Contract Reference Number. Provide the details of the case and instructions to implement the Hold Notice Procedure. List the nature and specifics of the complaint or threat. Identify the party making the claim. Local workstation - Laptop and/or department computer. Personal share or personal folders on servers. Home computer or smart phones. Email journals, backups, and archives. Removable storage media. Physical department files on and off site. 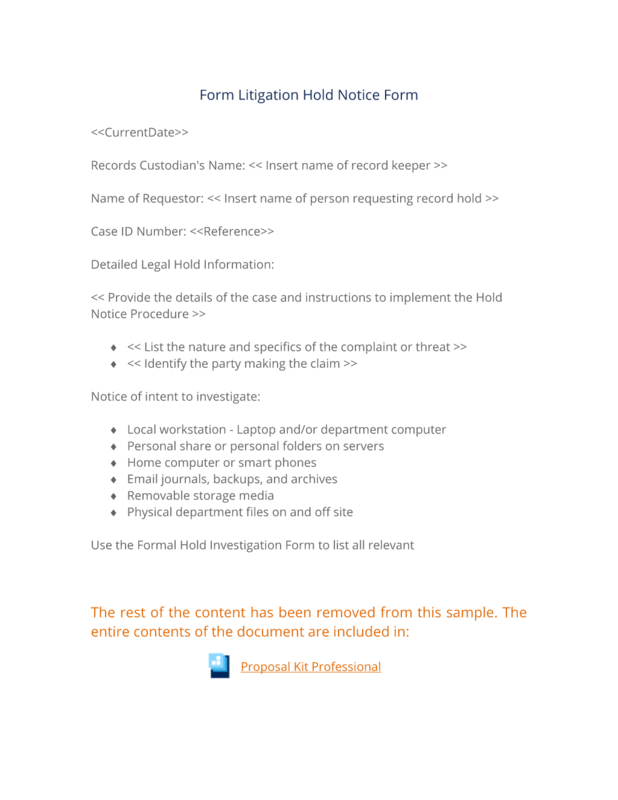 Use the Formal Hold Investigation Form to list all relevant documents. You will be notified after the content has been reviewed and the records to be placed on hold have been verified. Requires signature of the department or records owner for acknowledgement of the notification. The editable Formal Record Hold Notice Form document - complete with the actual formatting and layout is available in the retail Proposal Kit Professional.